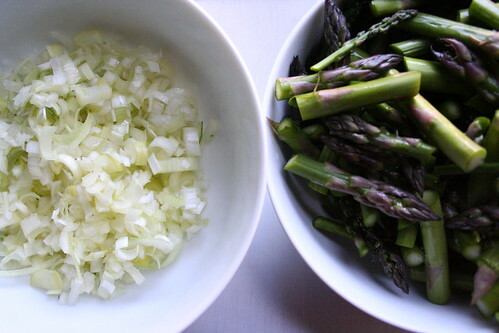 I had some asparagus and leeks in the refrigerator that I really needed to use up and I was contemplating what to do with them as I laid awake in bed this morning (yes, I think about food when I am waking up). Since I woke up pretty early and wasn’t falling back asleep, I decided I would get up and make a hearty Sunday morning breakfast for me and the hubby. 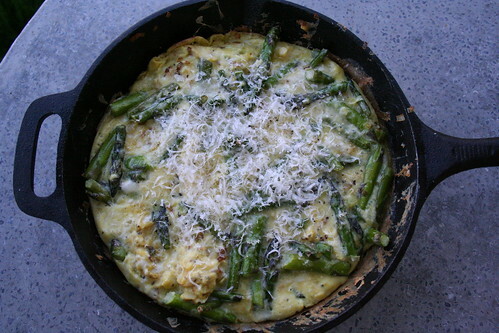 An Asparagus and Leek Frittata sounded like the perfect Spring weekend wake-up to me and it was. 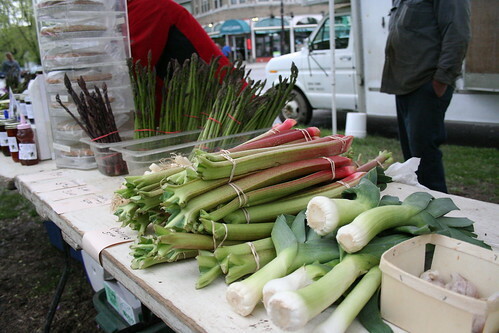 The subtle crisp from the fresh asparagus, the oniony bite from the leeks, the creamy cheeses and the tasty farm fresh eggs that we grabbed at the farmers market were all so perfect together. This recipe would also make for a great dinner. Melt butter in heavy cast iron skillet (9 or 10 inches in diameter) over medium heat. 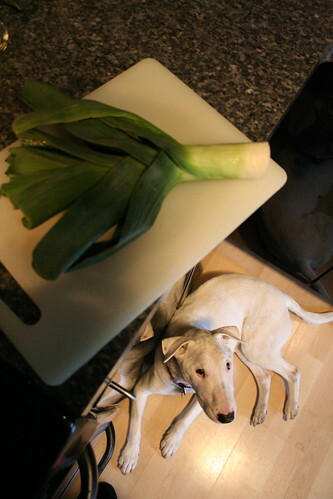 Add leeks, sauté 4 minutes. Add asparagus and sauté until tender, about 5 minutes. Whisk eggs, fontina cheese, salt and pepper in medium bowl. Add egg mixture to the skillet, fold gently to combine. Allow the eggs to begin to set. With a spatula, lift up an edge of the frittata and tilt the skillet to allow the uncooked mixture to flow to the bottom of the pan. Continue to lift until the egg on top is no longer runny. 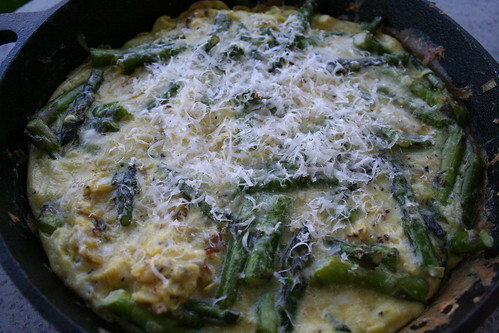 Sprinkle some freshly grated parmigiano-reggiano on top and slide the skillet into the oven. Bake the frittata until it is firm to the touch, about 5 minutes. Sprinkle with a bit more fresh parmigiano-reggiano when it comes out of the oven. Cut into wedges and serve. 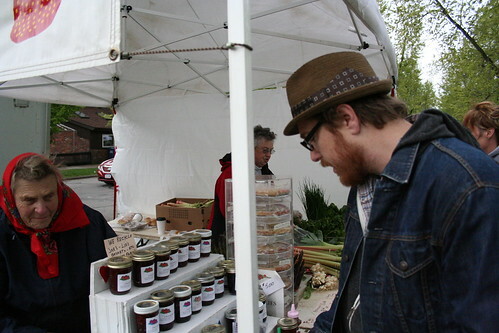 Yesterday was the first day of our big Farmers Market at Elmwood and Bidwell and I knew all week that the weather was doomed for it’s opening day. We decided to meet my parents there right at 9 am to possibly beat the rain and wind. It actually wasn’t too bad, though it felt more like a very cool Autumn Day, not Spring. We walked around, looked at everything, ran into friends and began to make a plan for what we wanted to buy. The sun even peaked out a time or two. Eventually dark clouds made their way overhead, the wind picked up and we knew we should probably make our purchases soon. 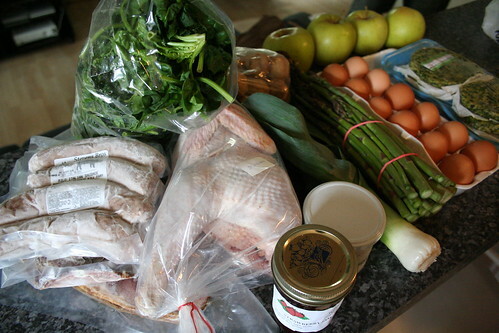 We got so much great stuff, apples, leeks, spinach, asparagus, baby potatoes, veggie burgers, yogurt leek sauce, homemade strawberry jam, fresh from the farm eggs, sausage, bacon, and a beautiful, whole, fresh Heritage chicken. I decided this would be dinner. A roast chicken. It was the perfect day for it, it was cold, rainy and windy and I just wanted to stay in. So, I took a look at everything else we bought and made a plan. Rinse the bird, inside and out and pat dry. Place the potatoes, leeks and apples in the roasting tray of a large roasting pan, place the chicken in the center (breast side up). Drizzle olive oil over everything, making sure to get a good light coating over the whole bird to give you a crispy, perfectly browned skin. Sprinkle everything with rosemary, sea salt and freshly ground pepper. You can also sprinkle the inside of the bird with your spices as well, I did that plus I stuffed a couple of chopped leeks in there, as well as a whole sprig of rosemary. Toss the vegetables gently to make sure they are coated. 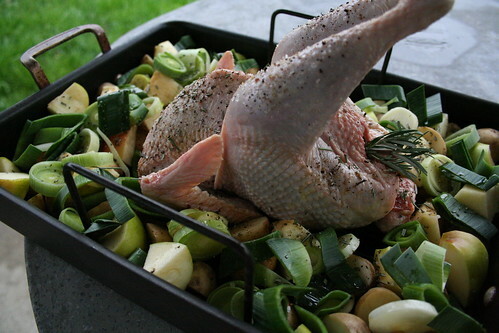 Roast the chicken until it is cooked through and the apples, potatoes and leeks are tender. I took the chicken out around 2 hours and the veggies could still use more time, so I took the chicken out to rest, took the vegetables out of the roasting tray so they could cook in the juices from the chicken and turned the oven up to 400° F. I wanted to get them really brown and crispy, the way we like them. Taste the veggies as they are done and season to taste with salt and pepper. Allow the chicken to rest 10-15 minutes before cutting into it, this will allow the juices to redistribute. 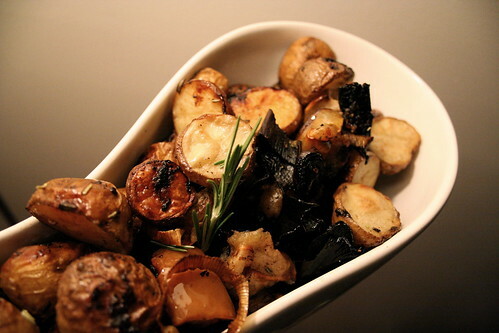 Serve with a nice helping of the apples, leeks and potatoes. We found that the Heritage Chicken was much different from any other chicken we had ever roasted before, it had an incredible scent when it came out of the oven and it tasted so amazing, a much more rich chicken flavor than from the grocery store chickens. 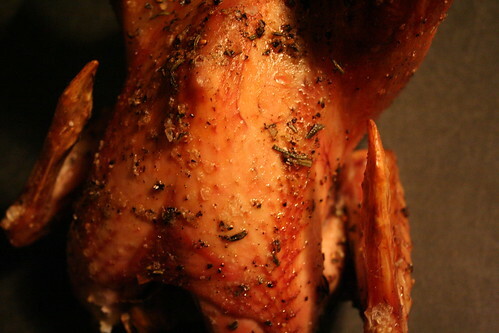 We found the dark meat to be very dark and slightly tougher (almost gamier), a bit more like a cornish hen. However, the breast meat was impeccable, what chicken should taste like, the best I have ever had. The skin, though I don’t typically eat it any way, was thicker than usual and tough to eat. Mark usually eats as much as he can before I start nagging him about the fat, but this time he couldn’t eat much. I’ll have to ask the women we bought the chicken from next week if there is a trick for cooking the Heritage birds, from what I had read it is best to cook these birds low and slow so as not to dry them out and toughen the meat. The legs on this bird seemed longer than I have ever seen and they were sticking straight up (! ), but I didn’t have any kitchen twine to truss them, so I went without. I am curious if that could have been why the leg meat seemed tougher, maybe it was overcooked. We ate dinner a bit later than normal last night, so by the time it was ready it was fairly dark and the pictures of the finished bird are not that great. Still working on a way around the night-time photos. All in all, this was the perfect start to the farmers market season, I cannot wait to make more meals this week with the goodies we bought and of course to go back next week.